Quiet, frugal, cool. You have to pay around 450 Euros (~$617) for the 17.3-inch notebook with a Kabini quad-core processor. Our in-depth review shows if you get a good device in return. Toshiba's Satellite C70D is a 17.3-inch office notebook for simple tasks like typing, web browsing, Skype and movie playback. The device is not completely unfamiliar since we already reviewed the 15.6-inch sibling Satellite C50D-A-10E (AMD A4-5000, Radeon 8330) with the same components a couple of months ago. 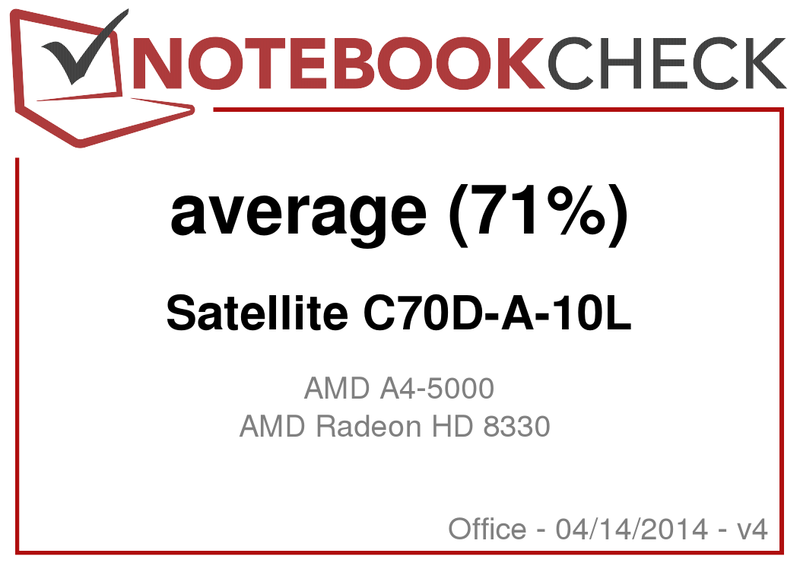 This notebook got a good rating (75%) and our review shows if the C70D can keep up with the C50D or if it is even better. We use the rivals Asus F75A (Pentium B980, HD Graphics (Sandy Bridge)) and Lenovo G700 (Pentium 2020M, HD Graphics (Ivy Bridge)) for the comparison. Lenovo already offers the refreshed G710-series that is based on Intel's current Haswell architecture. The Satellite C70D and Satellite C50D share many components, so we won't have a closer look at the input devices, the connectivity and the speakers in this review. The case, the design and the materials of the Satellite C70D are also similar to the C50D, but the C70D is obviously bigger. 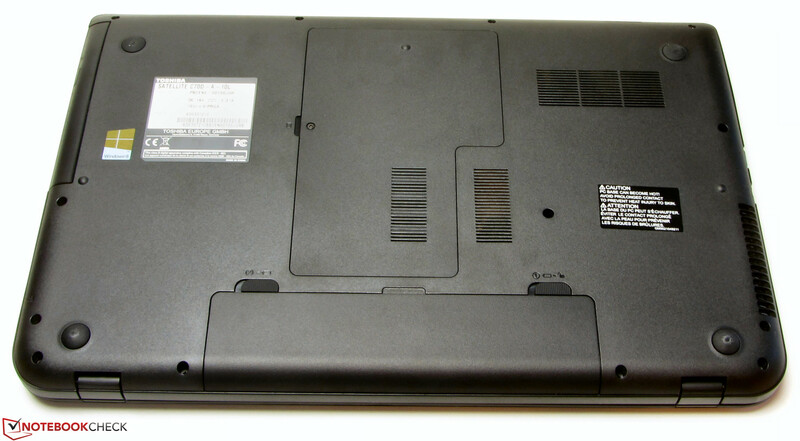 The notebook is completely made of plastic and that also applies for the F75A as well as the G700. All surfaces of the Satellite are matte black and both the palm rest and the display cover have a textured surface. 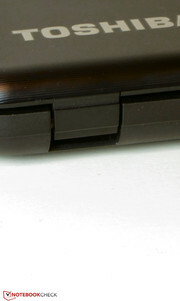 The stability of the case is still okay but you can dent it in the area above the DVD burner. 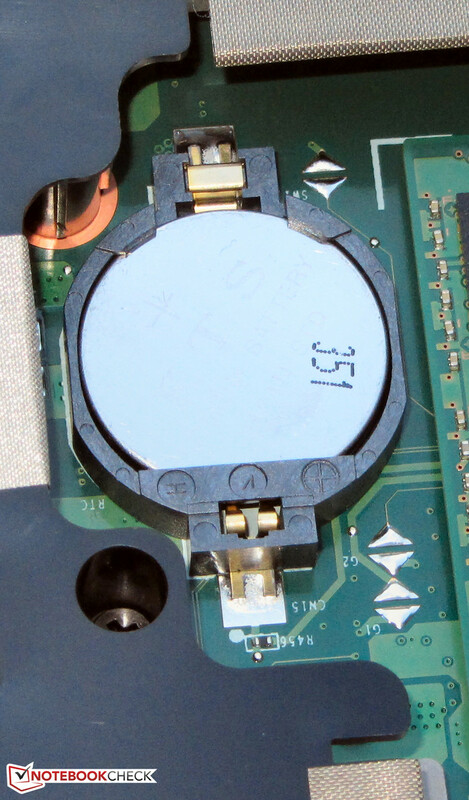 The torsion resistance is also pretty standard but you can easily twist the display. The display cover, however, is pretty sturdy and there are only a few spots where applied force is visible on the display. Both hinges keep the display well in position but there is some bouncing. It is only possible to open the lid with one hand when you shake the display a bit. All components are surrounded by a plastic case. All three devices within our comparison offer the standard ports, including at least one USB 3.0 port. Both the Satellite and the G700 are not up to date in regard to the Ethernet since they only have Fast-Ethernet ports while the F75A has a Gigabit-Ethernet port. We do not really like the port layout of the Toshiba; most of the ports are at the right side next to the palm rest. 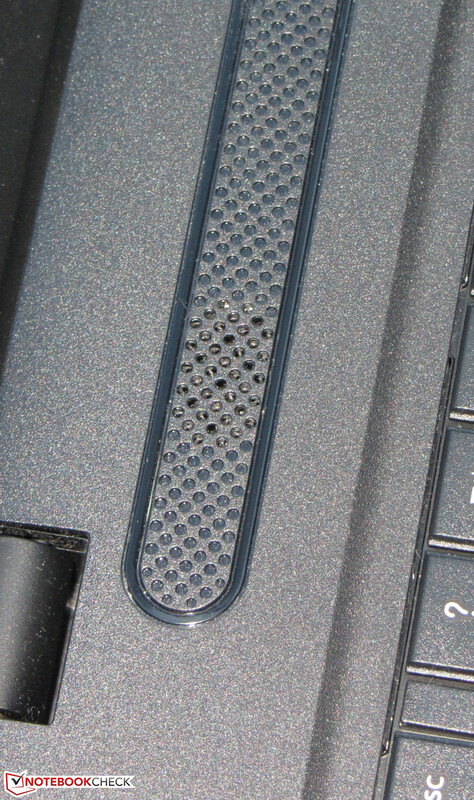 The C70D and C50D offer the same ports and the same port layout; only the position of the Kensington lock has been changed. The card reader is at the front. 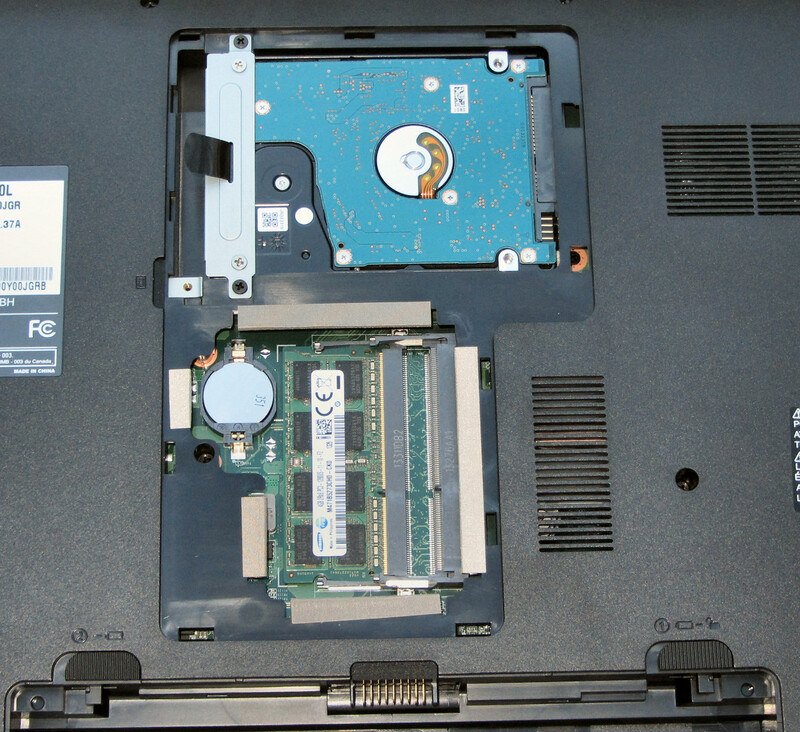 The Satellite comes with a preloaded version of Windows 8 (64-bit), but there is no Windows DVD. You should therefore use the provided Windows Toshiba Recovery Media Creator to create recovery disks after you get the device. 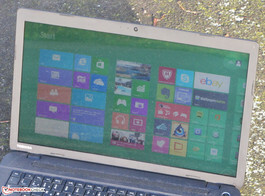 Toshiba only provides drivers for Windows 8 and 8.1 respectively, but it is still possible to use Windows 7 since all necessary drivers are available. Ethernet and WLAN work with the according drivers from the Toshiba homepage. According to the drivers list on the website it is also possible that the Satellite uses a WLAN module from Atheros, so you can use the according driver from the website Atheros.cz if the counterpart from Toshiba does not work. The APU/GPU is another story, neither the driver from Toshiba nor the current driver from AMD's website worked. Only the latest Beta driver (Catalyst 13.11) from AMD solved the problem. You will also need the according chipset driver from this website because it includes the necessary USB 3.0 driver; Windows 7 does not support USB 3.0 out of the box. The maintainability of the C70D is identical to the C50D. 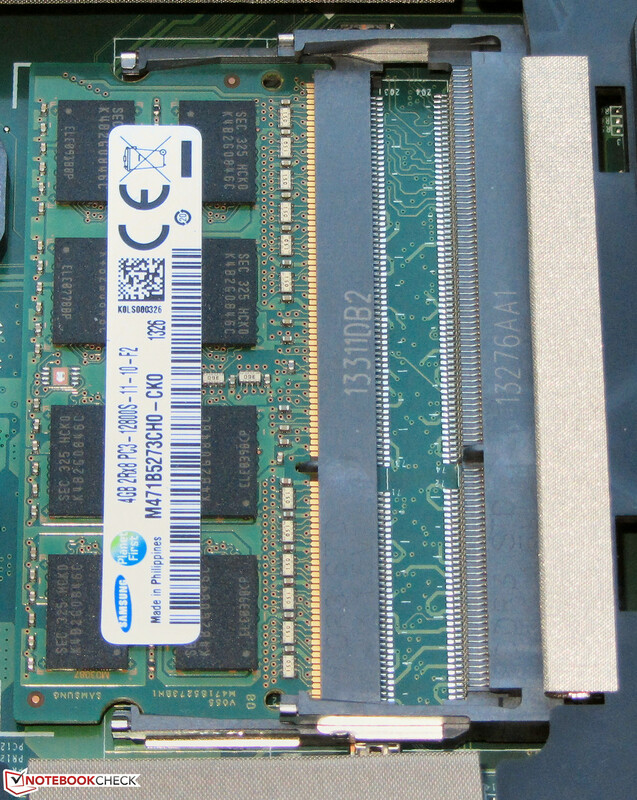 Both notebooks have two memory slots and one slot is occupied with a 4 GB module. 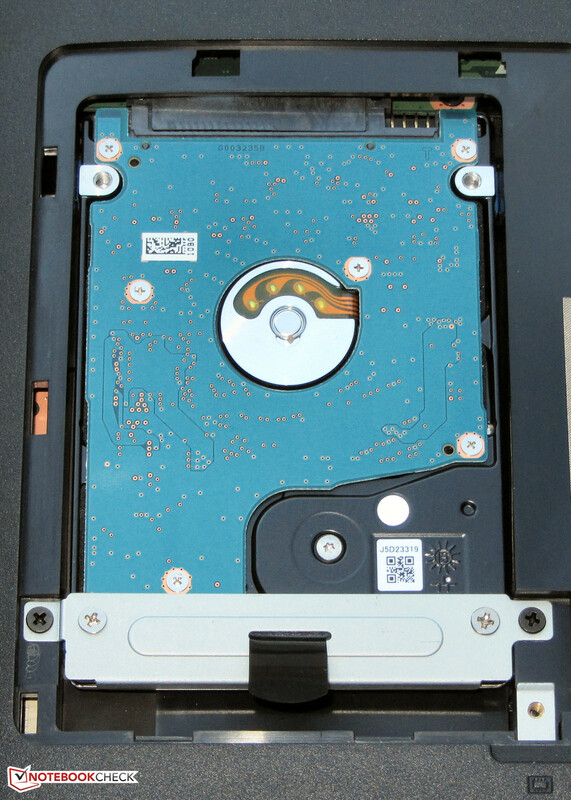 Replacing the hard drive is no problem, however, the C70D can only accommodate 2.5-inch hard drives with a height of 7 mm. There is also a sticker in the hard drive bay with this notice. 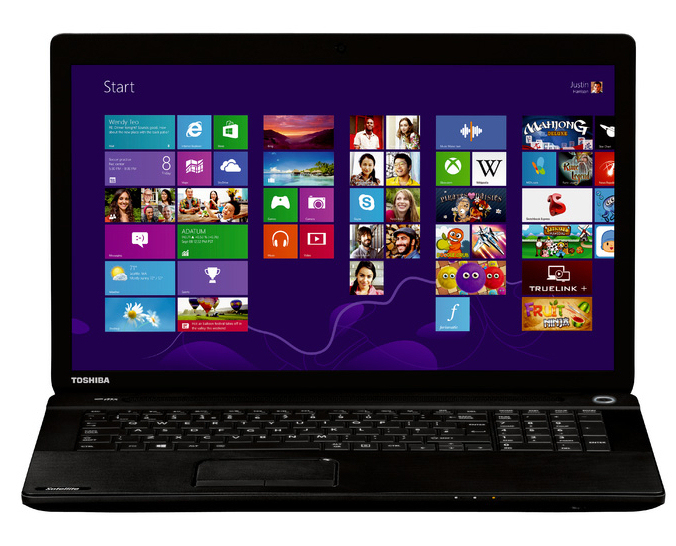 Toshiba equips the Satellite with a glossy 17.3-inch screen with a native resolution of 1600x900 pixels. The average brightness of the panel is decent with 239.8 cd/m², neither the F75A (219.9 cd/m²) nor the G700 (214.6 cd/m²) can keep up with that. Contrast ratio (483:1) and black value (0.54 cd/m²) of the display are not overwhelming but they are certainly reasonable. The C70D can once again surpass both the G700 (271:1, 0.89 cd/m²) and the F75A (291:1, 0.86 cd/m²). 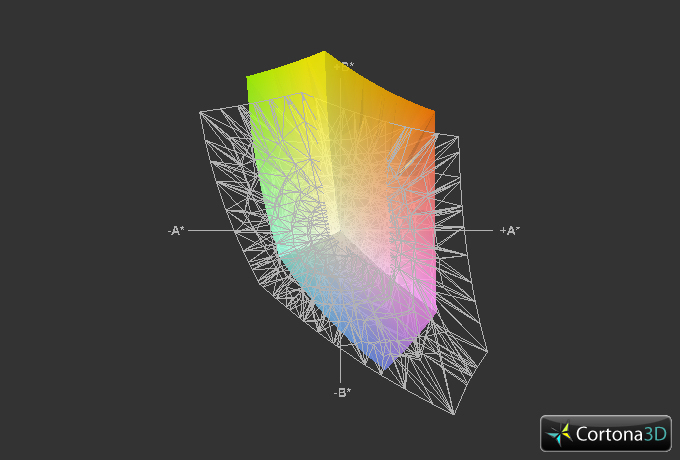 We can determine coverage of 60.2% for the sRGB color space and 44.7% for the AdobeRGB color space. They are important for professional picture editing, for instance. We measure an average DeltaE 2000 deviation of 11 ex-works, while the target value (DeltaE smaller than 3) is only managed by the color yellow. The display has a distinct blue cast. 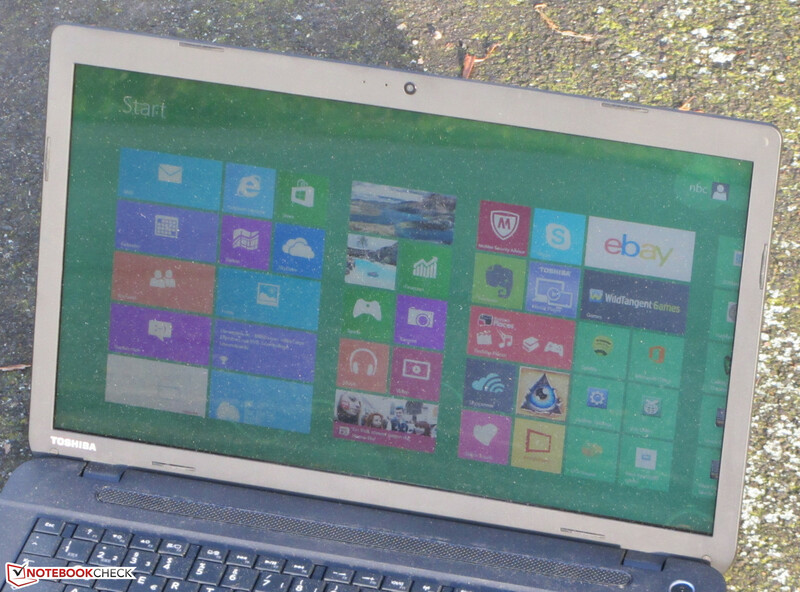 You can actually use the notebook outdoors, but you will have to adjust the display to avoid annoying reflections. There are no surprises in terms of viewing angle stability. It is pretty standard with a comparatively wide horizontal viewing angle. You can still see the display content from the side, but the picture gets darker the wider the angle gets. 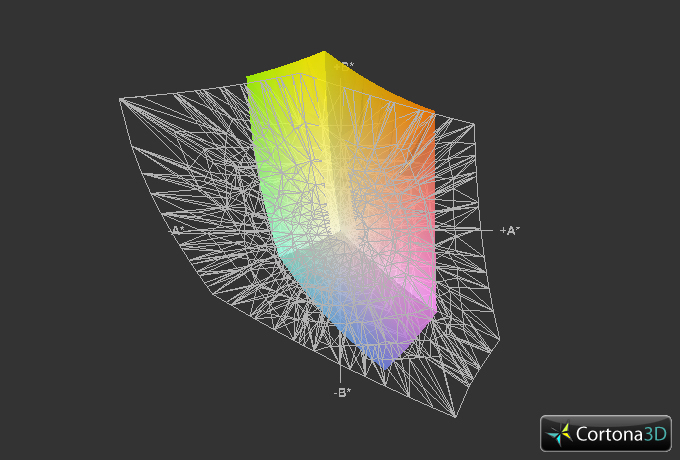 The situation is worse with vertical angles and colors will quickly start to invert. 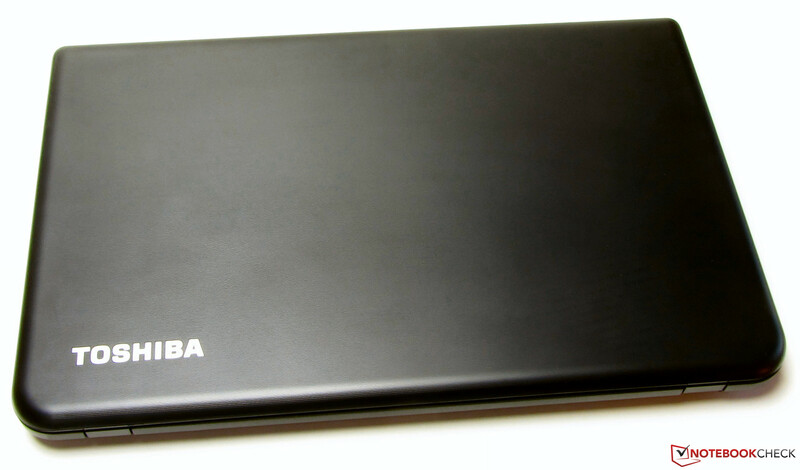 Toshiba offers 17.3-inch office notebooks with the Satellite C70D-series. They are primarily designed for everyday tasks like web browsing, Skype and movie playback, but the gaming capabilities are very limited. Our review unit is currently available for around 450 Euros (~$617). 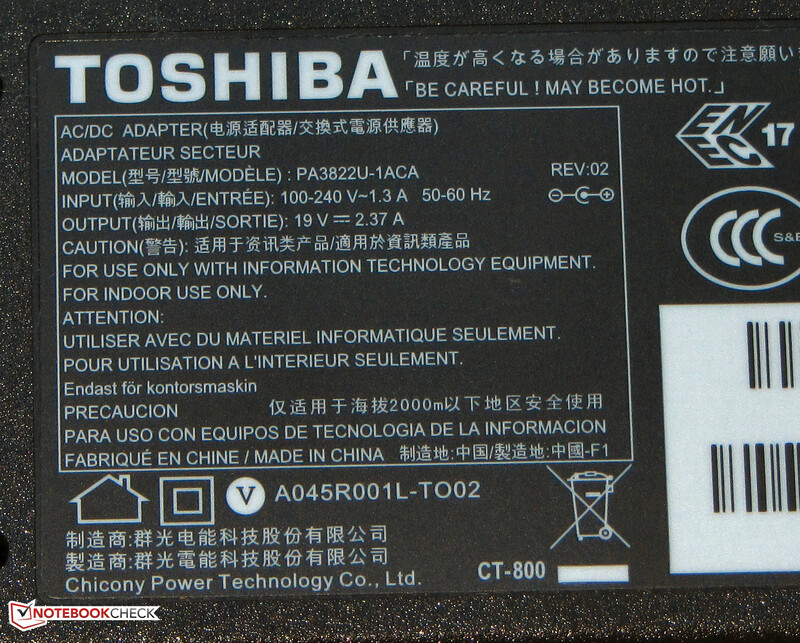 Toshiba also offers other configurations, starting with APUs like the E1-2100 up to the A6-5200. The identical C70-series uses Intel processors instead. The heart of the Satellite is a Kabini APU with the designation A4-5000. The CPU part of the APU is a quad-core processor with a nominal clock of 1.5 GHz, but there is no Turbo. This APU belongs to the frugal versions with a specified TDP of just 15 Watts. More information and many benchmark results can be found in our short review of the A4-5000 APU. We can see the full performance of 1.5 GHz during our Cinebench CPU benchmarks and the results are on an expected level. AMD's processor cannot keep up with the Intel processors inside the F75A (Pentium B980, HD Graphics (Sandy Bridge)) and G700 (Pentium 2020M, HD Graphics (Ivy Bridge)), but the difference in multi-thread applications is much smaller compared to single-thread scenarios. The two Intel CPUs heavily benefit from their higher clocks, but we would see a similar or even slightly better performance if the AMD processor would run at the same frequency - at least in multi-thread applications. The Satellite is the best device in the GL Test. We won't see any performance records, but the notebook does not cause any criticism either. The overall system works well and the PCMark results are similar to other devices with the AMD APU: Not overwhelming but acceptable. Both the F75A (Pentium B980, HD Graphics (Sandy Bridge)) and the G700 (Pentium 2020M, HD Graphics (Ivy Bridge)) have much higher scores due to their more powerful CPUs. You can increase the system performance with a Solid State Drive: Applications start quicker, the system is more responsive and the PCMark scores are higher. We tried it: Our SSD (Crucial RealSSD C300 - 64 GB) improves the PCMark 7 result of the Satellite by almost 72% (2,459 points). 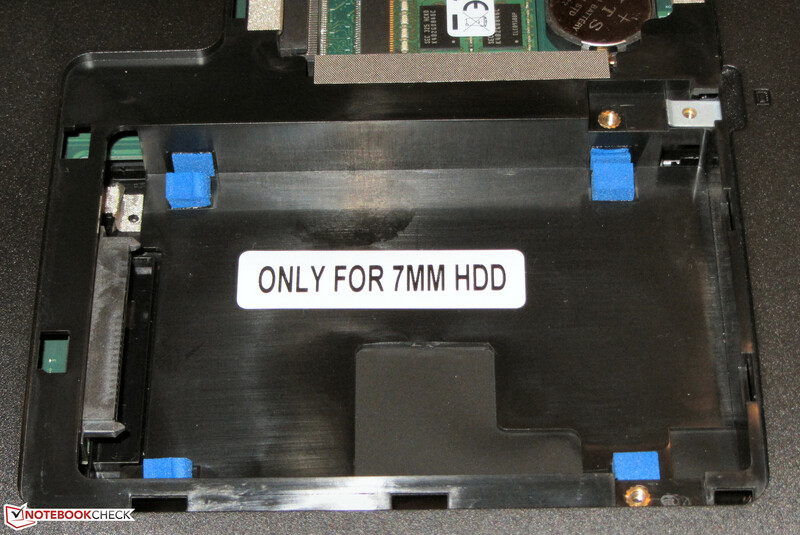 Toshiba uses one of its own hard drives for the Satellite. It has a capacity of 500 GB and works with 5,400 revolutions per minute. CrystalDiskMark determines a read performance of 99.59 MB/s while HD Tune measures an average transfer rate of 84.6 MB/s. These results are reasonable for a 5,400 rpm hard drive. Graphics are handled by the Radeon HD 8330 GPU. It supports DirectX 11.1 and runs with 500 MHz, but there is once again no Turbo. The Satellite can beat the rivals G700 (Pentium 2020M, HD Graphics (Ivy Bridge)) and F75A (Pentium B980, HD Graphics (Sandy Bridge)) in all 3DMark benchmarks. This is, however, not really surprising since the C70D has the most powerful GPU and is roughly on a level with the Intel HD Graphics 4000. The hardware of the Satellite is sufficient to run some games in low resolutions and with low details - for example Grid 2. Reviews of other notebooks with the A4-5000 APU also showed that even Anno 2070 and Dirt 3 should run smoothly. Less demanding titles like FIFA should be playable in higher resolutions and with higher settings. You can upgrade the G700 and the F75A with another memory module to enable a dual-channel memory configuration. The integrated GPUs benefit from that and you can get up to 20% more frames per second. This is, however, not possible for the Satellite, the integrated memory controller only supports single-channel configurations. If you want to play games on a regular basis you should get the Asus notebook or the G700 - just make sure you get a configuration with a dedicated GPU. Both devices are available with a GeForce GT 720M GPU. We already reviewed an according model from Asus with the F75VC-TY088H (Core i3-2370M, GeForce GT 720M), but our review configuration is not available anymore. Instead of a Sandy Bridge CPU (Core i3-2370M), the notebook is now equipped with an Ivy Bridge CPU (Core i3-3110M, designation F75VC-TY142H). The current retail price is around 500 Euros (~$686). The G700 with a Core i5-3230M and a GeForce GT 720M starts at 550 Euros (~$755, without Windows) or you can get the Haswell based successor G710 with a Core i5-4200M processor for around 600 Euros (~$824). 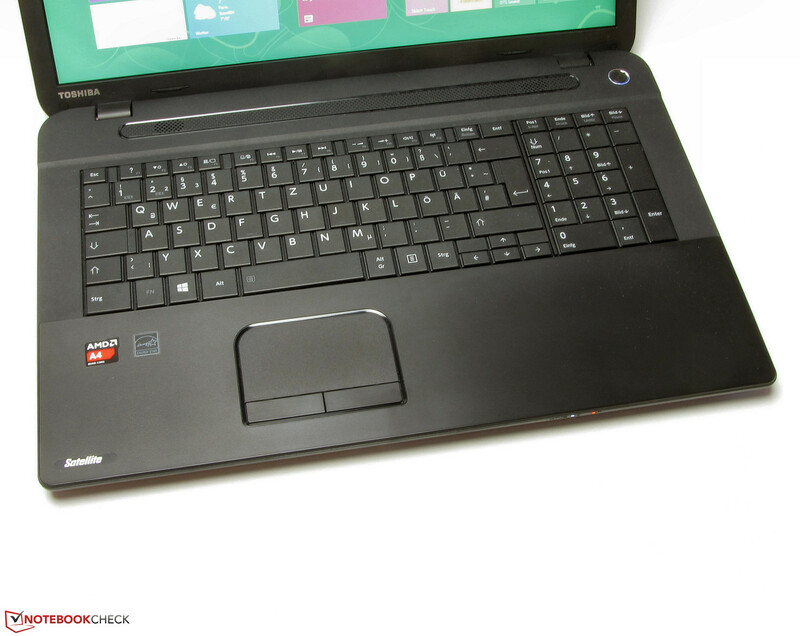 We already reviewed the current top version from Lenovo's G710-series. We measured up to 30.8 dB(A) during idle. 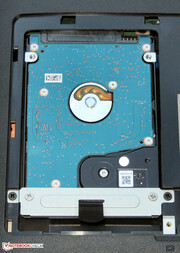 You can sometimes hear a noise from the hard drive, which increases the noise to 31.8 dB(A). The G700 (30.6 up to 30.7 dB(A)) and the F75A (30.8 up to 31.8 dB(A)) are on the same level. Medium workloads (3DMark06 running) and maximum load (stress test, Prime95 and Furmark simultaneously) only result in 30.8 and 34.5 dB(A) respectively. The increase is very moderate for the G700 (32.1 and 32.1 dB(A)) and the F75A (32.6 and 38.6 dB(A)) as well. We did not expect any problems in this section and the surface temperatures of the Satellite are always very low. This basically applies for the G700 and F75A as well, but the area around the fan gets quite warm under load. You should not forget that both notebooks use a standard voltage mobile processor. Our stress test (Prime95 and Furmark simultaneously for at least one hour) does not result in any throttling, the CPU always runs with the full speed (1.5 GHz), both with the attached PSU and on battery power. The GPU runs with 500 MHz during the stress test, but we can see repeated drops to 267 MHz. Battery power reduces the GPU clock to 400 MHz, but it also throttles to 267 MHz from time to time. 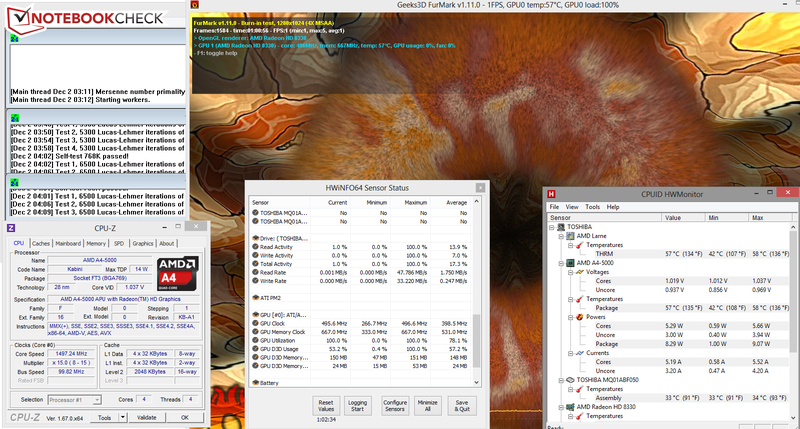 The CPU temperature leveled off at around 57 °C (with the PSU). (+) The average temperature for the upper side under maximal load is 25.3 °C / 78 F, compared to the average of 29.4 °C / 85 F for the devices in the class Office. (+) The maximum temperature on the upper side is 28.4 °C / 83 F, compared to the average of 33.9 °C / 93 F, ranging from 21.2 to 62.5 °C for the class Office. The Satellite consumes between 6.7 and 13 Watts during idle and Lenovo's G700 (6.6 up to 12 Watts) shows a similar behavior. However, the F75A (10.4 up to 16.6 Watts) needs more energy. Medium load (3DMark06 running) and maximum load (stress test, Prime95 and Furmark) result in a consumption of 22.3 and 27.5 Watts respectively. The G700 (27.9 and 35.7 Watts) and F75A (27.6 and 47.3 Watts) need more power. The Satellite manages an idle runtime of 6:55 hours. The F75A (5:25 h) has to be recharged earlier, but the G700 (13:13 h) has significantly more stamina. The idle runtime is determined with the Battery Eater Reader's Test. The display brightness is set to minimum, all energy-saving features are activated and the wireless modules are turned off. We determine a load runtime of 2:26 hours for the Satellite, neither the G700 (1:12 h) nor the F75A (1:05 h) can keep up with that. The Battery Eater Classic Test simulates the load runtime with maximum display brightness, high-performance energy profile and activated wireless modules. Our WLAN test is finished after 3:58 hours, the C70D is therefore right in the middle between the F75A (3:29 h) and G700 (5:16 h). This test uses a script to refresh websites every 40 seconds. All energy-saving features are active and the display brightness is adjusted to around 150 cd/m². DVD playback on the Satellite is possible for 2:39 hours; the F75A is on a similar level (2:45 h) and the G700 (2:58 h) is superior once again. The DVD test uses the energy-saving profile (or a higher energy profile if the playback is not smooth), maximum display brightness and deactivated wireless modules. We are somewhat disappointed by the DVD and WLAN runtimes of the Satellite and we certainly expected more from a notebook with a ULV CPU. The almost identical Satellite C50D-A-10E manages significantly longer runtimes - with the same battery capacity. 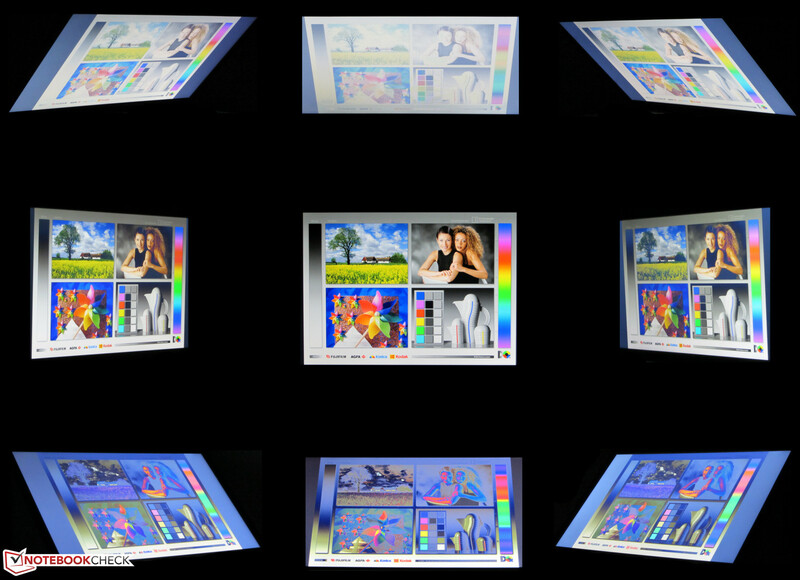 The larger, brighter and higher resolution display of the C70D should be the reason for the differences. 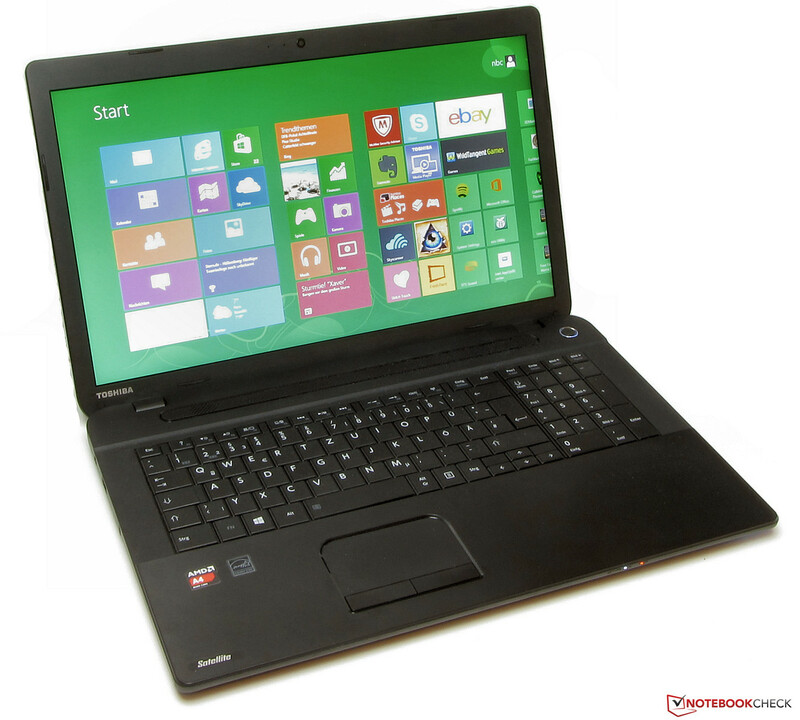 Toshiba's Satellite C70D-A-10L is a simple office notebook with a 17.3-inch screen that offers sufficient performance for everyday tasks - for instance text editing, web browsing or video playback. You should look for another device if you need more performance. The C70D hardly gets warm, is always quiet and does not consume a lot of energy. Unfortunately, the good consumption does not result in good battery runtimes. The display is decent if you consider the price of the notebook, but it has a distinct blue cast. The Asus F75A and Lenovo G700 are interesting alternatives if you need more performance. The G700 also has the longest battery runtimes within our competition. The DVD burner reads and writes every kind of CD or DVD. ...keep the display well in position. Two memory slots are available. You can only use a hard drive with a height of 7 mm. You can also replace the BIOS battery. 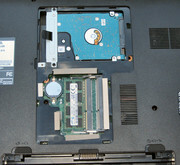 The DVD burner can be removed. ...and a capacity of 48 Wh. The quiet operation and the low energy consumption. 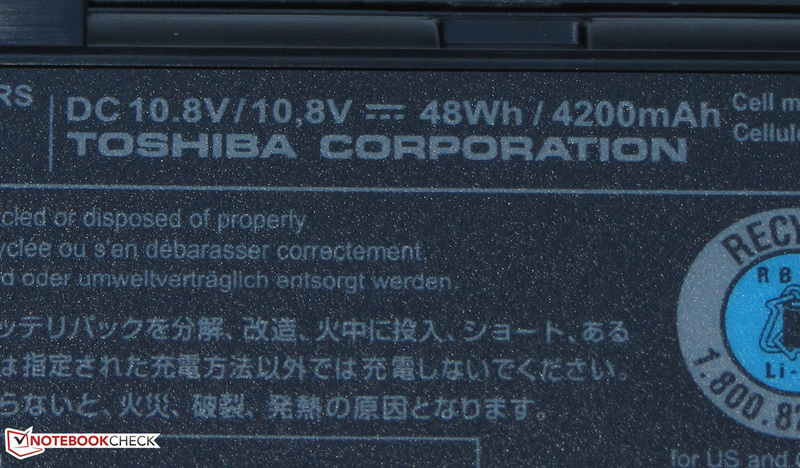 Toshiba cannot provide good battery runtimes, despite the low energy consumption. Asus F75A, Lenovo G700, Lenovo G710 59397112, HP Pavilion 17-e054sg, HP ProBook 470 G0 (H6P56EA), Packard Bell EasyNote LE69KB-45004G50Mnsk, Asus F75VC, Acer TravelMate P273-M, Acer Aspire E1-771G, Acer Aspire E1-772G.